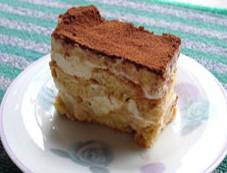 Elena, who lives in Feltre Italy, submitted this original Italian recipe for Tiramisu. Elena tells me that this is the REAL way to make Tiramisu, the way it's made and served in Italy. Elena also says to use the "best" quality mascarpone cheese in the recipe, as it's the mascarpone that really makes the tiramisu. 1). Whip together sugar and egg yolks until they become foamy. 2). Add mascarpone cheese to the egg yolk and sugar mixture and mix well, to avoid forming lumps. 3). Whip the egg white until it becomes very firm (until stiff peaks form) and gently fold it into the mascarpone mixture, (folding means mixing from the bottom to the top). 4). Spoon a little mascarpone mix into the bottom of a 9 x 13 inch baking dish; spread evenly. 5). Soak half of the savoiardi biscuits or ladyfingers in the warm coffee (or espresso) and place them on top of the mascarpone base. Then spread half of the mascarpone mixture evenly over the savoiardi or ladyfingers. 6). Soak the remaining half of biscuits or ladyfingers in warm coffee or espresso, and place over first mascarpone layer. Spread the remaining half of mascarpone mix over biscuits or ladyfingers. 8). Place in refrigerator for two hours and serve. *Notes: If you want, you can add a little rum or marsala to the coffee or espresso. The quality of Mascarpone cheese that you use for Tiramisu is very important, as Tiramisu depends almost, from the quality of the mascarpone. Fantastic! Even a novice like me came out with excellent results. My husband and his parents love it very much! Thanks Diana. Fantastic!!! No other recipe of Tiramisu beats this one! Thank you! This was so simple to make. I used a douple espresso from a coffee shop to make this. I just quick dipped the ladyfingers in the liquid othe wise they get to soft. In between the layers I did sprinkle a dark cocoa powder. I used my Kitchen aid mixer so the mixture turned out very creamy in texture. This is a great dessert for company. It looks so labor intensive but goes together so quickly. This tiramisu was excellent however I found it a bit too sweet. Next time I would cut down by a quarter the sugar and add 2 or 3 tablespoons of amaretto in the cream.